Like so many modern families, my wife and I both work while raising our teenage children. Life is a whirl of school, friends, and what seems like an endless stream of activities. Trying to balance all of this with our jobs and the small matter of feeding them nutritious meals everyday was beginning to feel a bit like wading through treacle – until we decided throw a retro solution at the situation! People, I’m talking about the one pot wonder tool that is the slow cooker. I’ve always been a fan of one-pot cooking, particularly at this time of year when your body craves comfort food and sustenance. For me, this is the food that transports me back to childhood and satisfies both pangs of hunger and the need for my meal to give me an internal hug. It is mood-lifting, energy-boosting, wonder food that quite simply says ‘I care about you’ to anyone lucky enough to be on the receiving end of a plateful. The slow cooker then, is the perfect partner for delivering this culinary message of love – and for bringing your time in the kitchen down to a few minutes of easy-peasy prep! Because let’s face facts – we are all busy people and slaving over a hot stove when you return from work isn’t really anyone’s idea of fun. Even mine! 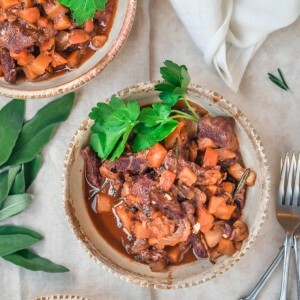 Check out these great Slow Cooking recipes over on Small City, Big Personality for inspiration. With this method, all you need to do is carve out 15 minutes of prep time to peel your veggies, seal your meat, throw in some pulses and pour a bit of stock into a pot. Simply whack the lid on and off you go. Imagine now, coming in from a hard day’s work only to be rewarded with the glorious aroma of home-cooked food wafting through your home and a lovely big pot of awesomeness perfectly ready just to spoon into bowls. Wholesome, authentic and if you plan ahead, enough to feed the family for a couple of days (go big – you’ll never regret it!). Quite apart from being quick, this is also cheap eating at its most nutritious. Slow cooking favours the cheaper cuts of meat and the sweet, delicious flavours of Scotland’s abundant root vegetables. At its heart it is peasant food, originating from thousands of years ago when farm workers would be given the tough, working parts of the animal to eat while the landed gentry feasted on fillet and loin. However, in my mind, a fatty shoulder, rich in flavour and left to bubble away all day amongst the seasonal vegetable and foraged herbs of the day was a far tastier and more luxurious meal to come home to! Speak to your butcher who will happily recommend similar cuts for your pot. I am a huge fan of lamb shoulder cooked simply with carrots, celery and rosemary and a cupful of barely – not too much mind, you don’t want to come home to meat porridge. Serve it with some mashed tatties, a spoonful of sharp mustard, and eat it out of a metal bowl for the full experience. Oh happy days! CHEF’S TIP: Ask your butcher to bone and tie your cuts of meat, which you should seal in a hot pan before adding to your slow cooker. These extra few minutes will ensure you create maximum flavour and will result in soft, pulled meat that will melt in your mouth.